Olerni LLC was established in 1997 and registered under the legislation of the Republic of Azerbaijan. The main activities of our company are to carry out production, maintenance and repair of the cranes, oil and gas separators, and the foam mixers belonging to the fire-fighting system. Our company has all necessary permits in accordance with the legislation of the Republic of Azerbaijan, has obtained the Russian Maritime Registry of Shipping and ISO certificate, and works to further improve its activities on the basis of international standards. 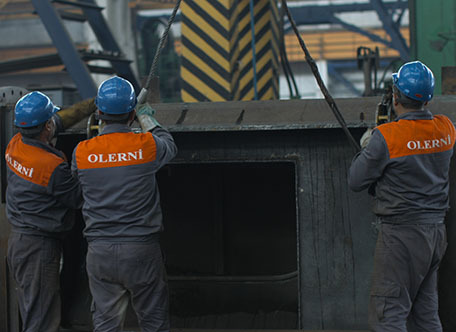 The Company Olerni keeps cooperation and partnership with up to 100 manufacturing companies and corporations in more than 15 countries around the world to supply goods and services to the oil and gas companies operating in Azerbaijan. Among these countries Russia, Ukraine, Turkey, Germany, Kazakhstan, Italy, Switzerland, France, England, USA, Japan, South Korea and others may be noted. Olerni LLC launched its new plant on October 21, 2017. The event was attended by the leading officials of the procurement department of the SOCAR, the Azneft Production Union, the Complex Drilling Works Trust, the SOGAR-AQS LLC, Bahar Energy Operation Company, and Global Energy Azerbaijan Company. In this event the OFSHOR crane for the offshore platforms that was the first production of the plant was tested and was successful. The plant implements production and repair works of all kind of the platform and ship cranes of various purposes, pressurized heavy reservoirs, metallurgy equipment which meet the most up-to-date requirements. Production and repair of the cranes with 5, 12, 24, 32 and 50 tonnes of load capacity is possible in this plant, which has no analogues in the Caspian Sea region. The successful activity of the Company Olerni conducts installation, operation and repair of the cranes on the SOCAR oil and gas facilities according to the requirements of the customer. Performing these works is based on enforcement the regulations and norms of the international and local standards on Quality Control, Occupational safety, health and environmental protection, continual improvement of the quality of services provided, social responsibility and the social importance of the enterprise. ▪ Enforcement of Quality, Occupational Safety, Health and Environment Protection requirements by all employees. ▪ Always trying to satisfy the actual and growing customer needs, avoiding the possible noncompliance and claims at all stages of the process.